Trichinella is probably the most dangerous parasite, living on the territory of Russia, Canada and north USA. This is a nematode (roundworm) can infect all mammals who eat infected meat. 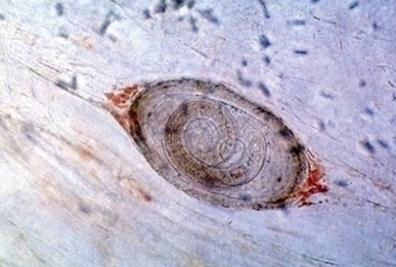 Trichinella is not possible to discern not armed sight, requires special laboratory expertise. So do not even try! Capsules with Trichinella enter the stomach of a mammal, the meat is digested, and the larvae are released from it. Two days later, the larvae become adults and attach the small intestine. After fertilization, the females the males die. The female gives birth to 1-2 thousand larvae, which then enter the blood and lymphatic vessels and spread throughout the body. Survive only those that fall striated muscle with a good blood supply (preferred diaphragm, tongue, masseter muscle). In the muscles they grow up, twisted into a spiral, making it a 25-30 day after infection two or three turns, and then walled up in a capsule, which is six months calcify. As such, the larvae remain viable up to 25 years. The value of trichina capsules 0.3-0.4 mm. 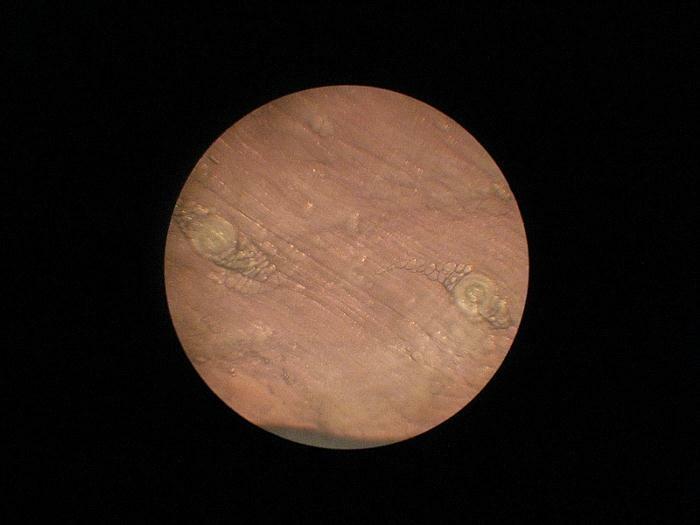 Infection of muscle larvae of Trichinella can reach 15,000 per kilogram of tissue. This is a dangerous disease causing pathogen Trichinella spiralis (There are other subspecies of Trichinella). Usually, infection occurs without any symptoms or complications. The main clinical occurrences Trichinosis common to all of his forms is fever, swelling, muscle pain. Fever appears to first days of illness, and is stored in 2-3 weeks, sometimes up to 3 months. Swelling of the eyelids and entire face is so characteristic for Trichinosis. Edema can distribute the neck, trunk, and limbs. Muscle aches and pains arise through 1-3 days after the onset of edema and is also one of the characteristic symptoms. Most marked pain in the muscles of the eyeballs, chewing, calf muscles, flexors of the limbs. Used for the treatment of Mebendazole, Albendazole, Thiabendazole. Simultaneously prescribed antihistamines drugs. Trichinella is very resistant to a prolonged stay at high and low temperatures, as well as not afraid of salting and smoking. According to some, to kill the trichinae, you need to cook the meat for at least 2.5 hours, at a thickness of a piece of no more than 8 cm. According to others in the meat of an old animal, bearing larvae have long, capsules with larvae become calcined and heat treatment does not kill them. Been deemed that the trichina is killed at a temperature of 74°С for 15 seconds when the larva is not long. Seasoned hunters recommend cooking meat is suspicious in two steps. Cook the meat for approximately half an hour, then give it to cool slightly, then continue cooking thoroughly. The fact that during the cooling, the larvae leave their cozy capsule, thinking that the time they arrived - they are already in the intestines, and the second phase will finish cooking them completely. Trichinosis is often found in polar bears, ferrets, raccoons, cats, Trichinella found in a badger, water rat, nutria, hippo, seal, walrus, hedgehog, marmot, porcupine, lion, tiger, leopard. The same can be infected and domestic animals such as pigs!